Alan Stern, the principal investigator of the New Horizons space probe, goes by the name NewHorizons2015 on Twitter. This inspired me to make one with the browser version. Pluto and Orcus in a rotating frame holding Neptune stationary. 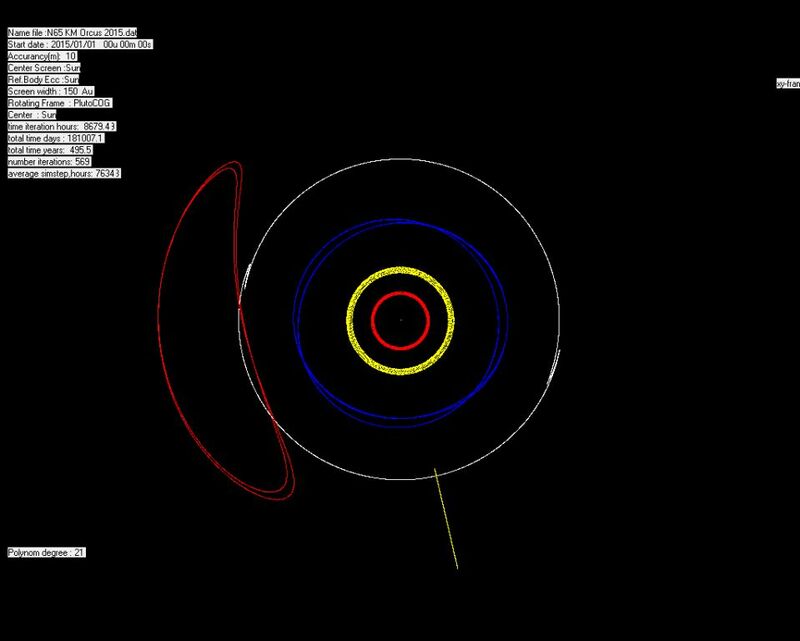 This simulation illustrates one of the reasons Orcus is sometimes referred to as the anti-Pluto. Have you tried to set the rotating frame to Pluto ? I did so , covering 40000 years from now . In my sim Orcus seems to be on an oscullating tadpole orbit , but not quite going as far as the opposite side from Pluto . Wonder if you get the same result . In this case Orcus is rather a "coorbital " to Pluto. I've checked my simulation of Orcus again and have the impression Orcus is on a semi tadpole orbit in rotating frame to pluto . Screenshot covers the first 500 years from now ( Pluto is represented as a yellow line ) . The orbit of Orcus will come closer to Pluto's , then intersect and moving away again to the left , but never getting to the opposite site of Pluto's. It seems Orcus is a coorbital of Pluto in a librating orbit . In order to place "Orcus " in a broader perspective I introduced a new topic "Plutinos"
If you set Pluto's mass to 0 in the simulation, Orcus would still have tadpole behavior to Pluto. The orbits of Pluto and Orcus are only related because they're both related to Neptune.